A UNEP solar energy system, the largest of its type in Africa. 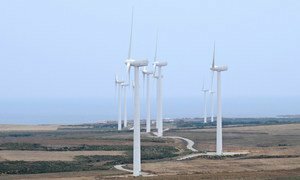 Charting data from 54 African countries, a new UN atlas reveals the continent's energy potential; revealing that investment in renewable energy would strengthen its economic advancement. “The Atlas makes a strong case that investments in green energy infrastructure can bolster Africa's economic development and bring it closer to achieving the Sustainable Development Goals (SDGs),” said Juliette Biao Koudenoukpo, Director and Regional Representative of the Africa Office for the UN Environment Programme (UNEP). As such, she continued, it is an important policy guide for African governments as they strive to catalyze national development by making use of their energy resources. The Atlas of Africa Energy Resources , released by UNEP and the African Development Bank at the World Economic Forum being held in Durban, South Africa, shows both the potential and the fragility of the continent's energy resources, which are at the heart of Africa's socio-economic development. While Africa is richly endowed with both renewable and non-renewable energy resources, its current energy production is insufficient to meet demand. About a third Africa's population still lacks access to electricity and 53 per cent of the population depends on biomass for cooking, space heating and drying. According to UNEP, energy consumption on the continent is the lowest in the world, and per capita consumption has barely changed since 2000. The poorest African households spend 20 times more per unit of energy than wealthy households when connected to the grid. A kettle boiled twice by a family in the United Kingdom uses five times as much electricity as a Malian uses in a year, according to UNEP. “This Atlas will be instrumental to ease access to information and data in the energy sector for all stakeholders, including the donor community, African governments and the private sector,” said Amadou Hott, Vice-President in charge of power, energy, climate and green growth, African Development Bank. Providing information in the form of detailed 'before and after' images, charts, maps and other satellite data from 54 countries through visuals, the Atlas details the challenges and opportunities in providing Africa's population with access to reliable, affordable and modern energy services. Prepared in cooperation with the Environment Pulse Institute, United States Geological Survey and George Mason University, the Atlas consolidates the information on the energy landscape in Africa, highlighting some success stories of sustainable energy development around the continent, but also shining a light on major environmental challenges associated with energy infrastructure development.